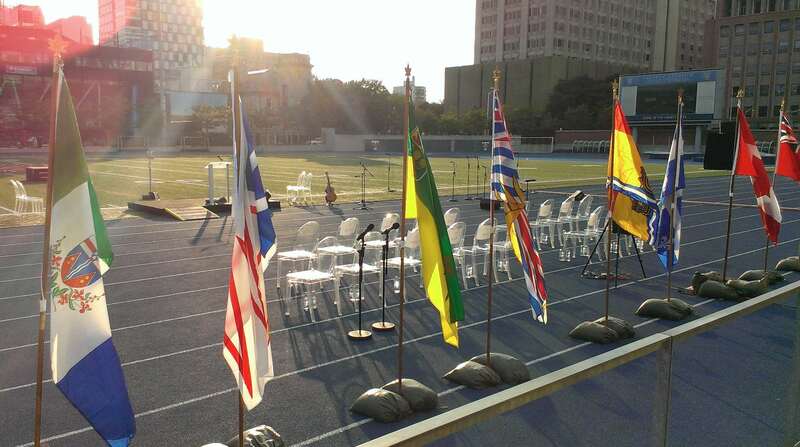 At the “In Memoriam” event , July 31st 2014: the speakers’ platform, seating for distinguished guests, and flags of Canada, its provinces, and territories. ActiveHistory.ca is featuring this post as the first piece for “Canada’s First World War: A Centennial Series on ActiveHistory.ca”, a multi-year series of regular posts about the history and centennial of the First World War. 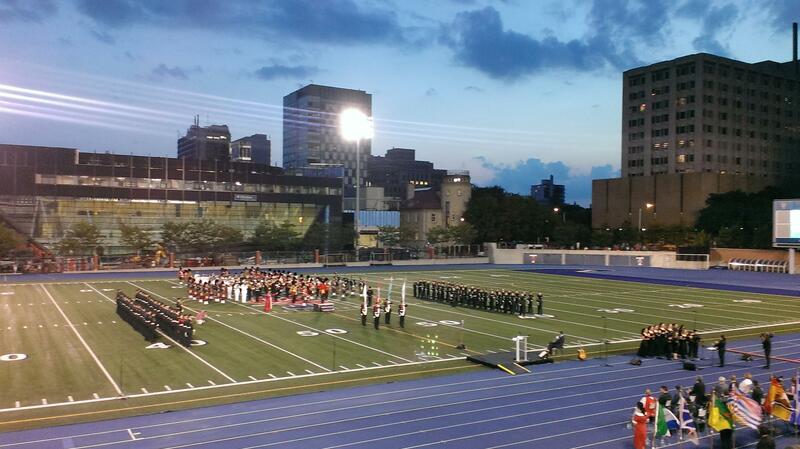 A sizeable audience turned out for a First World War commemorative event held at the University of Toronto’s Varsity Stadium this past July 31st. The grandstand was more than half full, so there were probably three thousands of us in attendance. We crowded near the centre to best view the proceedings on Varsity’s (sadly) artificial turf. Passing clouds occasionally filtered or blocked a setting sun, which dropped below the horizon near the end of the event. The beautiful evening light perfectly suited organizers’ plans. “1914-1918 In Memoriam” was, as the Master of Ceremonies explained, held at sundown to echo the poetic hour given to mourning and remembrance, as in Binyon’s “For the Fallen”. The event’s timing, we were told, also paralleled the last hours of peace a century ago. On August 1st 1914 Russia went to war with Germany and Austria, which in three short days pulled in France and Britain, and much of the rest of the world. I quibbled to myself that a war was already raging on July 31st 1914 between Austria-Hungary and Serbia, but admitted such details, and others I noted during the evening, were not really the point at an event such as this. 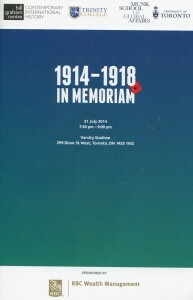 Unlike the “1914-1918: The Making of the Modern World” conference at the University of Toronto’s Munk School for Global Affairs that was tied to this public event, “In Memoriam” was about performing big, collective meanings for a general audience. I found out about the event via online announcements and chatter, later encountering posters on TTC subway cars. Retired broadcast journalist Brian Stewart mentioned it in his July 30th column for CBC.ca, and now that I had the event program I saw that he was the MC, and a Fellow of the Munk School. Looking up I glimpsed some of the “pageantry” that event posters promised – members of a military band waiting for things to start. As performance, the event did not disappoint. Each speaker was polished, and all the more engaging for the variety of their styles. The stadium’s video screen showed historical pictures that ranged impressively in their content, and were synchronized with speeches and performances. When a vocalist sang lines from “Keep the Home Fires Burning,” the screen showed historical images displaying this phrase on banners promoting patriotic voluntary work. The different military dress uniforms attracted the eye, and the parading was impressive. Band music is not my thing, but I had to admit that “The Maple Leaf Forever” was catchy. The song’s performance was emblematic of the Canadian nationalism on display that evening. It was performed by the band, rather than sung, which obscured the song’s explicitly English-Canadian nationalist lyrics that celebrate an imperial past – by kicking-off with Britain’s victory over France on the Plains of Abraham, for example. The distinguished guests ignored all that too, implying instead a story of an imagined national community united by shared values. Chief of the Defence Staff, General Thomas Lawson, clearly outlined such a vision. He referred to shared Canadian values, claiming that the Armed Forces personnel he commands serve the cause of “freedom”, as Canadians had from 1914-1918. Lawson was more frank about the costs of service than other speakers, when he not only rhymed-off the numbers of Canadian dead and wounded, but also emphasized the traumatic effects of war on combatants. He followed this by indirectly defending the military’s approach to preparing personnel for war trauma, for civilian re-integration, and for treating PTSD. However much his statements deserved critical attention in light of news about this topic, and of changes to veterans’ services, he was certainly accurate in saying nothing like this was available to First World War soldiers. The best that other speakers could say about the costs of war was that they were borne by individuals and families. But this, too, fit the theme of nationalism, since the speeches and songs characterized war service, injury, and death as sacrifices for the nation and its great cause. Ultimately, the event gave no insight into the history of Canada or the First World War. Historian Margaret MacMillan’s remarks, which included warnings about the war’s resonance with contemporary international relations and the legacy of militant nationalism, were whispers in an orderly celebration of the “People of the Maple Leaf,” as the song penned by Lieutenant-Governor David Onley put it. The tune honoured Canada’s martial past, reassuring us that we were brave, got along well together, and lived in a wintry place. Stewart had prepared us for these perspectives (except for the wintry one) in an opening address that stressed the nation-making importance of fighting wars. If Canada’s national “seeds” were sown when we came together to fight the War of 1812, he surmised, then our impressive efforts in the First World War led to their “blossoming” into nationhood. I expected healthy doses of nationalist sentiment and positive interpretations of the war’s significance for Canada, but felt the event could have done better than merely remember Canada’s First World War as a nation-building experience. General Lawson’s speech offered evidence this was possible at big events with little time for speaking. While proudly nationalistic, his alone provided any insight into the interface of war and Canadian society. And only Lawson called on us to read the work of historians and then make up our own mind about the war. I can be cynical about the narrow range of works on Canada’s war available for attendees on the typical bookstore shelf, but as I left I felt greater disappointment about the event’s narrow focus. Why not mention the enfranchisement of women and Canada’s support for the creation of the League of Nations as suitably positive nation-improving results of the war? It would take no effort to avoid associating these developments with the failure of interwar diplomacy and the gerrymandered 1917 federal election. Would even these points have risked the event going off message? But rather than seizing an opportunity to engage an interested and attentive audience in some collective thinking about the war, “In Memoriam” was a polished embrace of traditional nationalism. I consider that darkly ironic, when remembering a war with causes and consequences that included national strife at the international and domestic levels. Nathan Smith is a Canadian historian living in Toronto. He is affiliated with the University of Northern British Columbia (UNBC) as an Adjunct Professor. He has taught at UNBC, SUNY Empire State College, and the University of Toronto. The caption for the post’s final image is obviously wrong (woops!). It was taken near the event’s conclusion. Thanks to Nathan Smith for the description of the In Memoriam event at Varsity Stadium, Toronto. The photos reminded me of a similar gathering on a suitably wet day in May 1919. The grandstand was also half full for a ceremony honouring the 15th Battalion, 48th Highlanders Regiment, which a cousin of mine was a private in. Below is a link to a photograph of the event, a wide-angle shot which takes a while to load, but is rewarding if you click to zoom in on the faces in the crowd and on the field. One vignette I noticed is a group of boys toward the right end of the stands, holding a flag which some of the soldiers on the sideline are looking up at. Unfortunately, my cousin is not in the photo. He died on the Somme in 1916. Thanks for your comments Russ, and the link to the great photo! I’ve read newspaper accounts of the 15ths return and reception in Toronto (and the other big receptions that year), but this is easily the best photo I’ve seen. It’s interesting how similar the grandstand in the picture is to the current version of Varsity Stadium (and not to the brick stadium taken down some years ago). Impossible to tell from the photo, of course, but the 15th was among the earliest Canadian units to see action, and also among the last to get home (with almost entirely different personnel, of course).